Today I added a card for the new Russian T-14 Armata Main Battle Tank. You can find it in the “Vehicle Cards” section. There is relatively little known about this new tank and lot of the information available is good educated guesses at best. So please understand that the data on the T-14 card is not guaranteed to totally accurate, but it’s certainly close enough to be playable. As more info becomes available and/or the design of the vehicle changes, I’ll do my best to keep up with the most current data and update the card. The T-14 is a monster vehicle, slightly larger than any of the M1 variants, it also has very impressive armor. The T-14 will be slightly harder to penetrate than the M1 but due to it’s larger size it will be slightly easier to hit than an M1. While the T-14 uses a 125mm smooth bore gun just like the T-72, T-80 and T-90, it has an improved autoloader system. As a result the T-14s rate of fire is 8 rounds per turn (4 per fire phase) just like the Abrams. If you need to take out a T-14 from the front, a Hellfire missile might be your best bet. 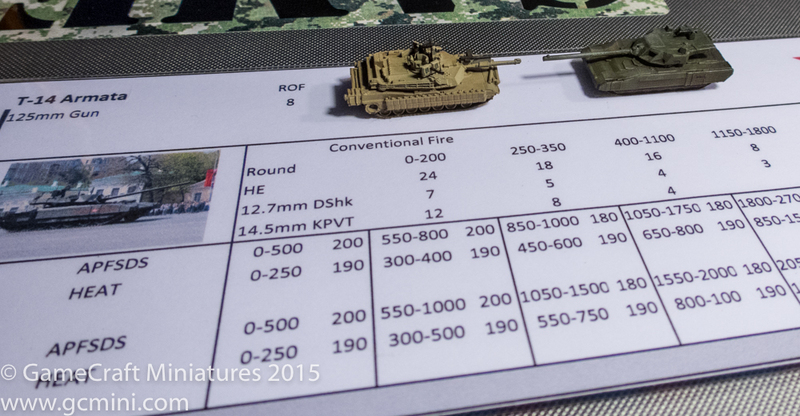 This entry was posted in Updated Data Sheets and tagged Armata, Russian, T-14 by Allen. Bookmark the permalink. You can see a prototype in the photo.